Since I have been pregnant I have realised I do sit down a lot more and just think about things. Most of the things I think about is my girls. Sometimes about all the memories we have already, the new ones which are too come and that guilt. The guilt that most parents experience. If you haven't experienced it yet, I am sure you will soon enough. Bringing your own children up is not easy. No one said it was. Parenting doesn't come with a set of rules and guide book. You can spend so much on a book but it won't compare to real life. You will end up giving your child a row, you will end up locking yourself in the bathroom and end up sitting on the floor in tears. You'll go kiss them goodnight, hold their hand and just stare at their beautiful innocent little faces. That is when it mostly hits you. The guilt. What kind of guilt? Mum/Parent guilt. You feel really sorry for them that you gave that big row during the day, you feel guilty for saying the mean word 'NO' to them, you feel guilty for getting frustrated, fed up or miserable with them. But in reality, you can not take it away. The child and yourself have bad days. But at the end of the day you love that child so much and that child loves you back. Your child looks up to you. You're their hero. I've caught Mia just staring into my eyes/face before and smiling at me when I caught her. The time Elliw holds my face and says 'I love you Mammy'. The bedtime saying 'Night Love you, Sweet dreams'. The long hugs and cuddles you get when they are tired or just feeling cuddly and snuggly! They are the times that you treasure. When you look back at memories, you don't remember the bad days but you remember the small things. 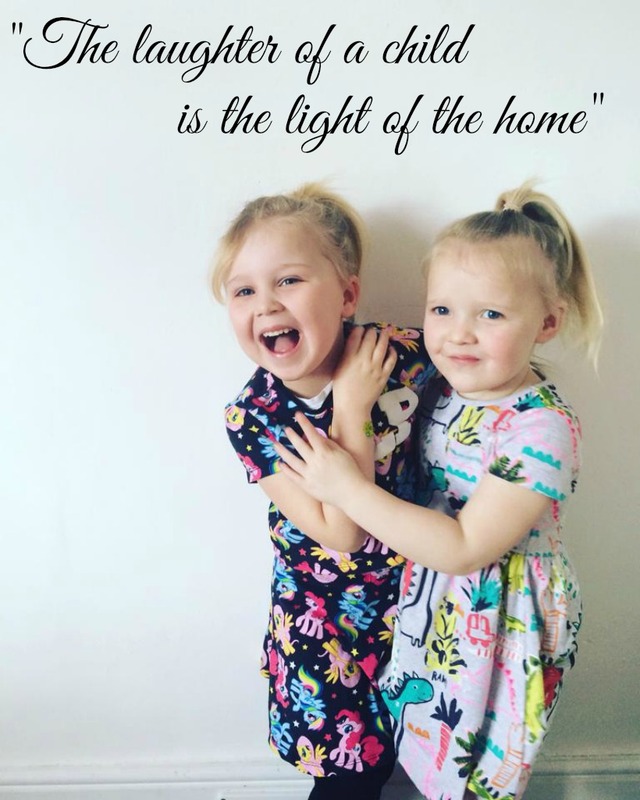 The laugh of a child sure does bring the light into the home. Children grow up so quickly. Too quickly. But if we live for now, make those memories, it's all worth it. Make no regrets. Because we only live once, make the most of it with your children. Ps, I love that photo, how pretty are those dresses? I have a lot of mummy guilt from the past. Stuff I wished I didn't do so things would be a bit easier not but you only learn as you go along. Being a first time mummy was hard, second time around is much easier.